I have a confession to make. 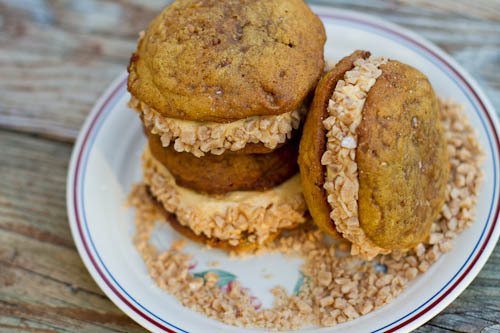 These were really supposed to be amazing chewy pumpkin toffee cookies. Apparently chewy and pumpkin cookies are notorious nemeses. Had I consulted the internet before attempting such a perilous undertaking I could have saved myself much heartache, wasted butter, and trays of puffy pumpkin "cookies" taunting me with their flagrant cakiness. I felt like a failure. A fraud. What happened? Why did my cookies turn into cakes? It's all the pumpkin's fault. I learned that the high moisture content of pumpkin puree was the cause of my demise. There are two purported solutions: simmer the puree until the moisture is cooked out, or use pumpkin butter instead of puree. Well, what's done is done. 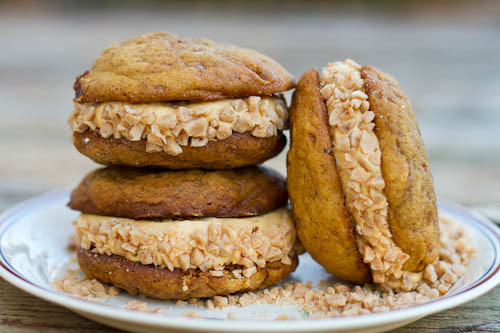 I'll tackle chewy pumpkin cookies when my ego has had time to heal. In the meantime, what to do with these blasted cookie-cakes? Truth be told, while they made god-awful cookies in terms of texture, the flavor was what I was looking for -- full of pumpkin spice warmth and tasty toffee bits. Come to think of it, these cookie fails were quite successful muffin tops. And that's when it hit me. Whoopie pies! (Or shall I say whoopsie pies.) My first grade art teacher always said, "Make a mistake work for you," so this one goes out to you, Miss Morrow. I whipped up some Pumpkin Cream Cheese Frosting (which rocked if I do say so myself), and sandwiched a generous dollop between two of my pumpkin cookie-cakes. A finishing touch of some toffee bits along the edges and I had myself something to whoop about. A pumpkin cookie whoopsie turns into a whoopie with some quick thinking and a dose of Pumpkin Cream Cheese Frosting (which, I am now convinced, can cure all baking woes). Sift together the flour, cornstarch, baking soda, salt, cinnamon, nutmeg, and allspice. Set aside. 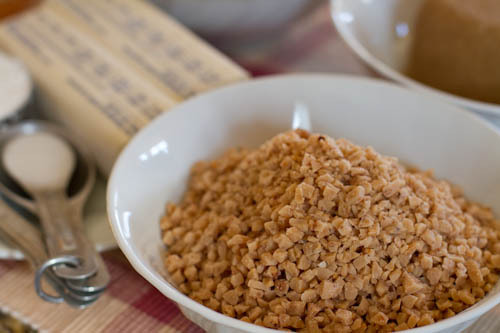 Add the dry ingredients to the wet mixture in thirds, mixing together until everything is incorporated. Stir in the toffee bits, reserving 1/2 cup for garnishing. Cover the bowl of dough in plastic wrap and refrigerate for an hour. 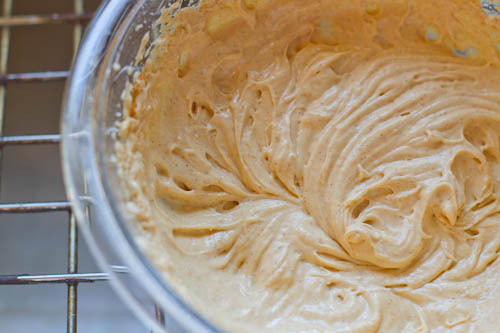 Make the Pumpkin Cream Cheese Frosting and stick it in the fridge to chill too. Preheat the oven to 350º. Scoop the dough out using a trigger ice cream or cookie scoop and place on a parchment paper-lined baking sheet. The cookie-cakes will spread, so keep it to 6 per baking sheet. Bake for about 10-12 minutes or until the edges are brown and the center puffs up. Transfer to cooking rack immediately or else the toffee bits tend to stick. Let cool completely. Put together your Whoopie Pies: Spread a big dollop of the Pumpkin Cream Cheese Frosting onto the bottom of one of the cookie-cakes using a butter knife or piping bag. Sandwich together by placing the bottom of a second cookie on top of the frosting. Roll the exposed frosting side of the whoopee pie over a plate of the reserved toffee bits so they stick. Enjoy! 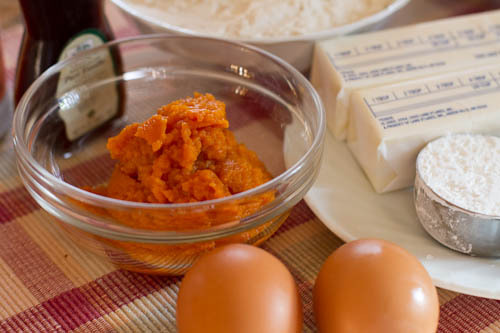 With an electric mixer, mix together the cream cheese and pumpkin puree until smooth, about 3 minutes. Scrape down the sides and bottom of the bowl to ensure even mixing. Add the vanilla, cinnamon, nutmeg, and allspice, and mix. Slowly add the powdered sugar until it's as sweet as you want. Refrigerate for an hour before using.